Welcome to California! Yesterdays miles passed effortlessly. A strong tailwind definitely helped us along, but evening a headwind couldn’t have ruined the mood. 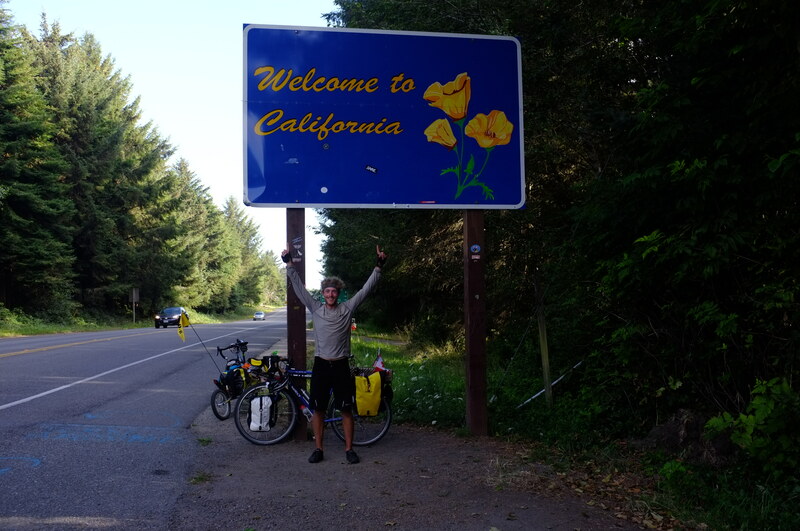 Reaching the California border is a major milestone for my trip and feels surreal. I still cannot believe I am here! 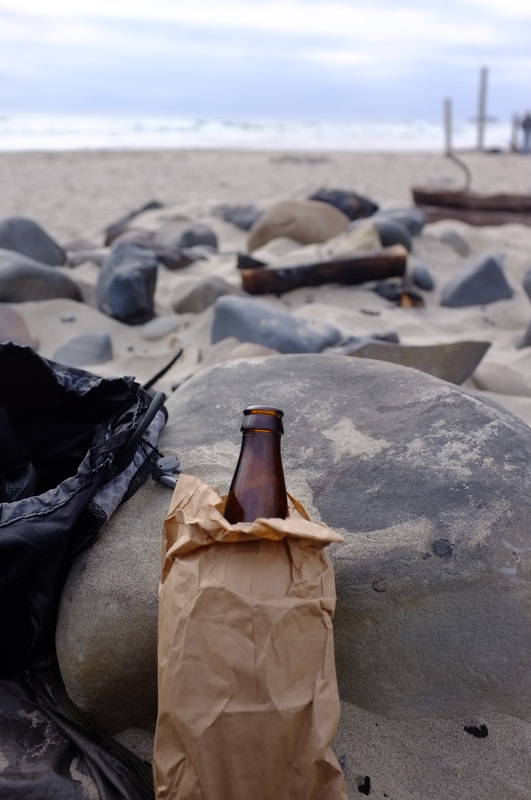 A beer on the beach while reading a book after a long days ride. What could be better! 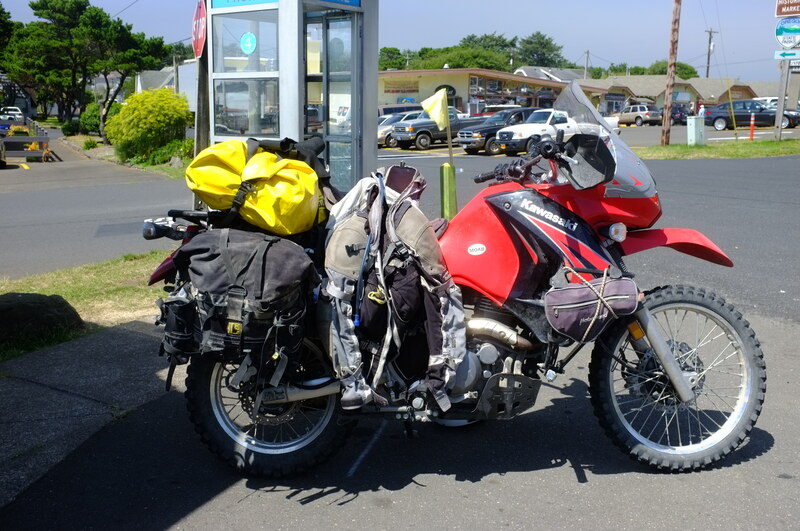 1,115 miles – Two days ago, I hit the thousand mile mark, a major milestone for any tourer. Today I reach another milestone. In a few short hours I will be crossing the California border. Tomorrow, I enter the redwoods. And tonight at midnight I am one month into my journey. I was a little cranky typing my last blog entry. Now, nothing can hamper the mood! Two days ago, four solo tourers came together. I now have the pleasure of riding with the Pedaling Yeti, Krysta, and Dave. Jesse, the Pedaling Yeti, began his journey in Virginia and followed the trans-am route across the country. Not ready to call it quits, he is now on his way to San Diego, CA. Check out his blog: http://www.crazyguyonabike.com/The_pedaling_yeti. Krysta is basically riding the same route as myself, though she is calling it quits at the border. Check out her blog: http://www.krystaarwen.com. 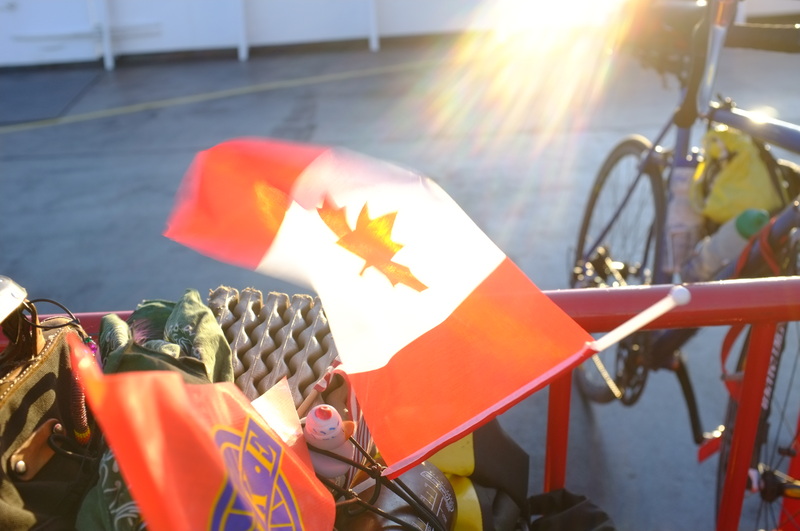 Dave is riding from his home in Canada and is riding as far into Cali as he can before running out of time. Everyone asks him, and I do mean everyone, “Ausy or Kiwi?” He is originally from the UK. Dave is not keeping a blog. Riding as part of a group is such a different experience than riding solo. I am very much enjoying being a part of this group. Hanging out with a few beers late into the night laughing and carrying on. Good times. 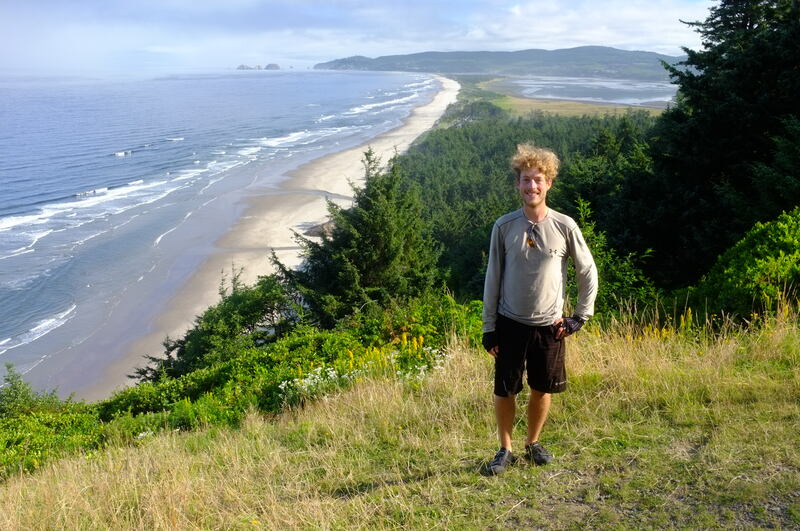 Today, I leave the state of Oregon. I’m super excited. The last few days, the scenery has been, well, epic. Wooded roads suddenly open up to hundred foot drop-offs into the ocean. Waves batter rock outcroppings and whales exhale plumes of mist dozens of feet into the air before diving deep their tails raising high out of the water. Tail winds have finally found me and push me effortlessly on my way south. 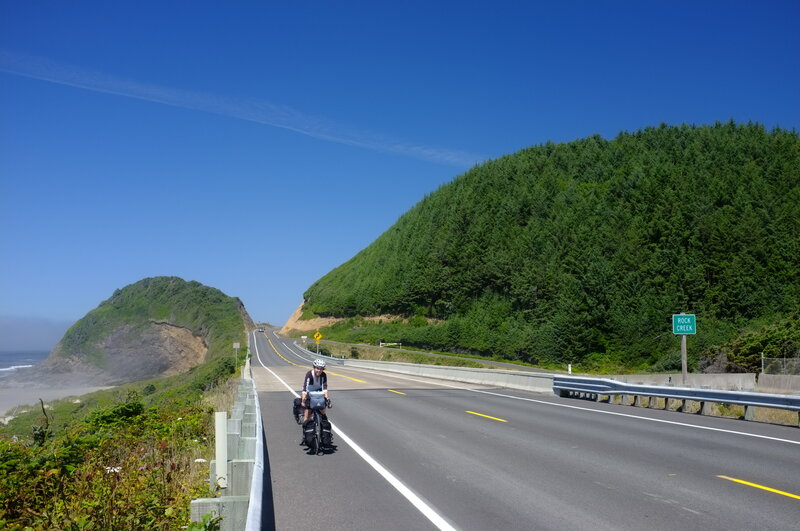 The last hundred miles have been the most beautiful section of the Pacific Coast. I can barely contain my excitement. 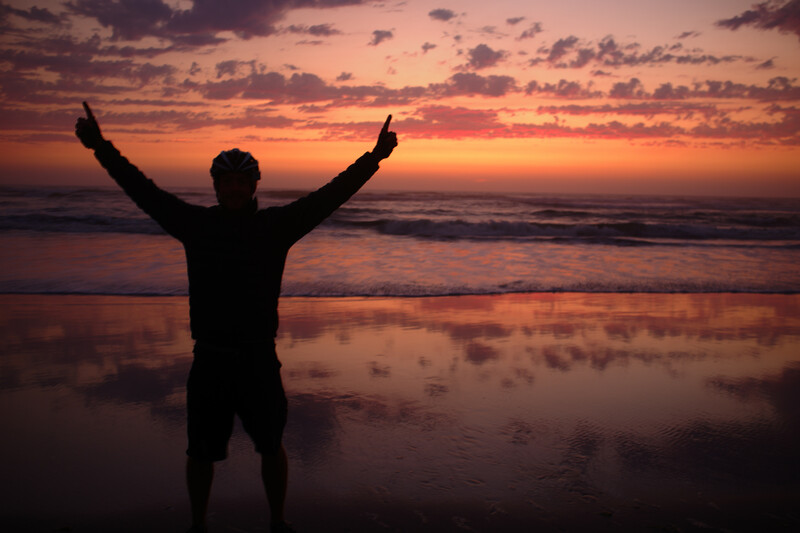 Being a part of an amazing group of people, crossing the California border, enter the redwood forests, where I plan to take a rest day or even two, and spending time in San Fransisco, CA have my spirits at an all time high. Another state down also has me that much closer to Mexico. The Mexican border is where this trip truly begins. 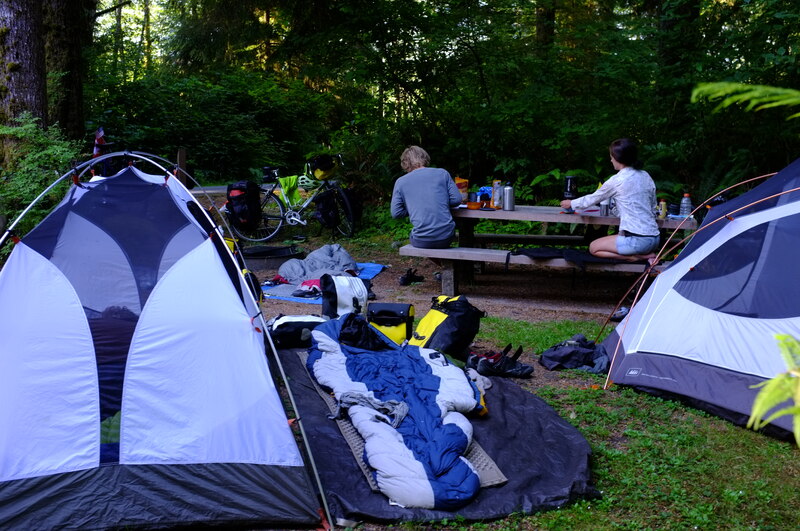 Camping with Dave, Krysta, and Jesse the Pedaling Yeti. The weather in this part of the world is much colder than I expected. Morning temps are in the low 60’s. High temps are in the 70’s rarely going above 80 degrees F. It is always windy. Luckily, these winds are usually at my back or my side, but occasionally they are in my face. I haven’t had rain since the San Juan Islands. Life is fantastic. Why am I pedaling when a motor could be doing all the work?!?! 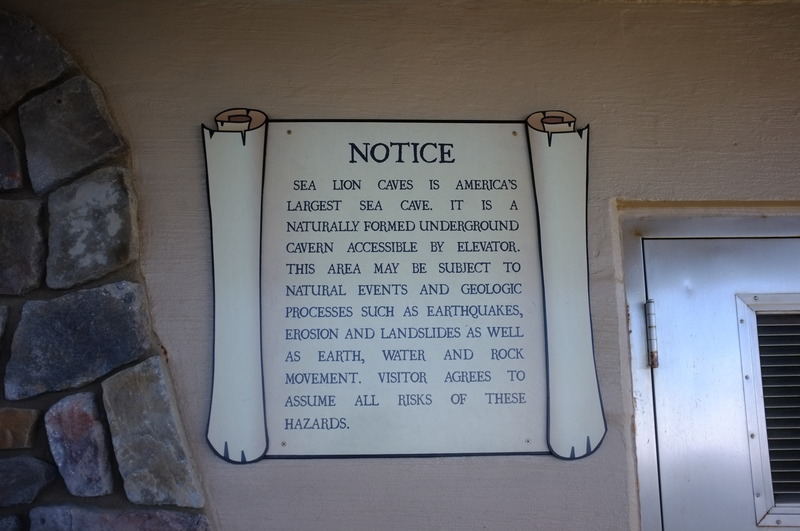 Down into the worlds largest sea cave! 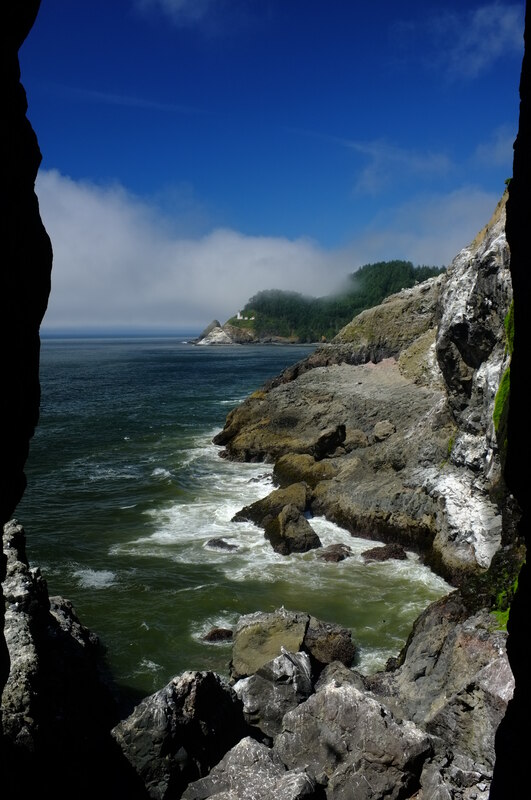 The view out of the worlds largest sea cave. 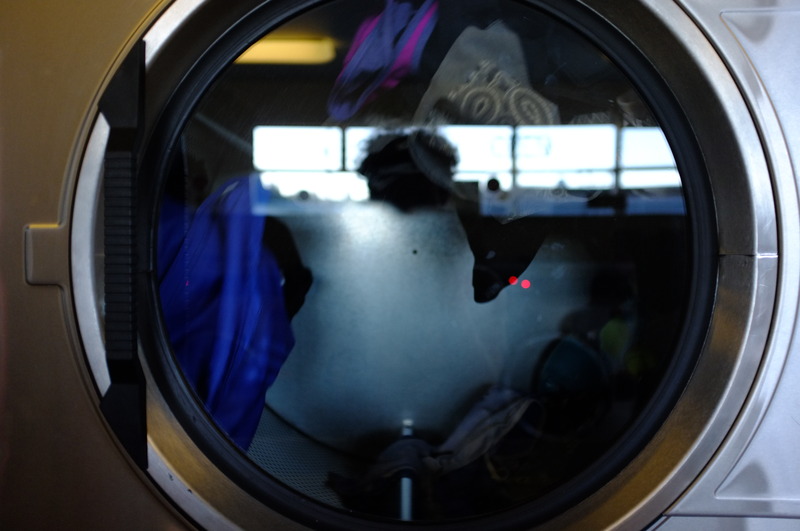 Krysta likes washing her clothes. I decided to wash my as well. 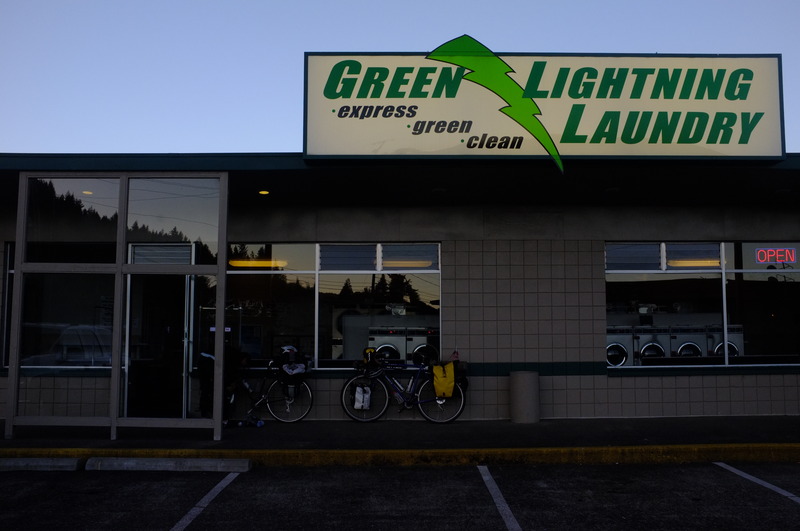 The first wash since Seattle weeks ago! They feel so soft and smell so good! Around and around they go. 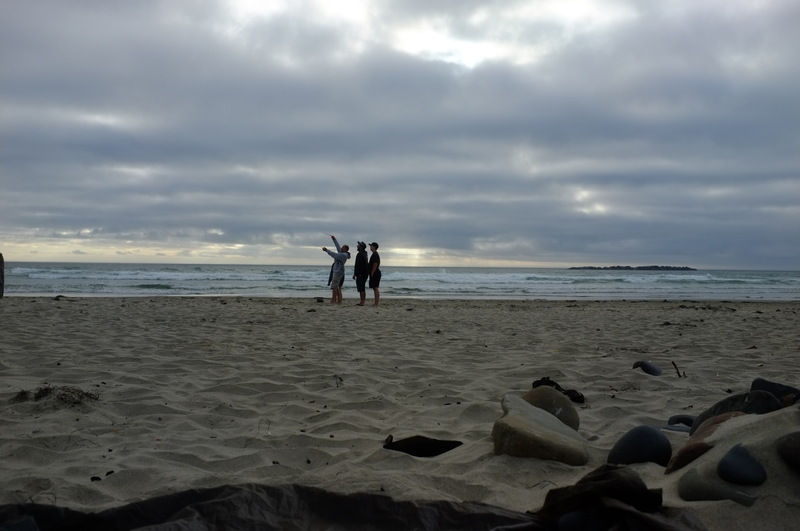 Flying a kite on the beach. One of the few things to do as the water is way to cold to swim in. Welcome to the goup of Misfits! 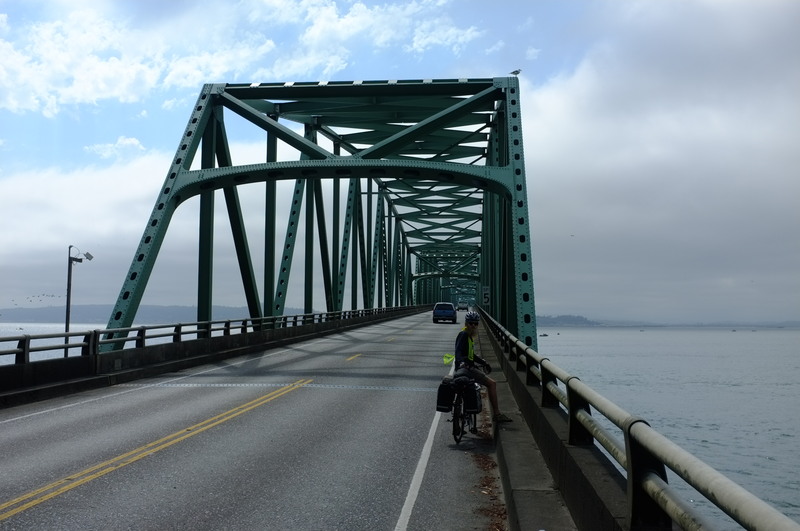 Free food aside, two days ago I crossed the 4.1 mile long Astoria-Megler Bridge and reentered Oregon. My 400+ mile detour north was well worth my time. 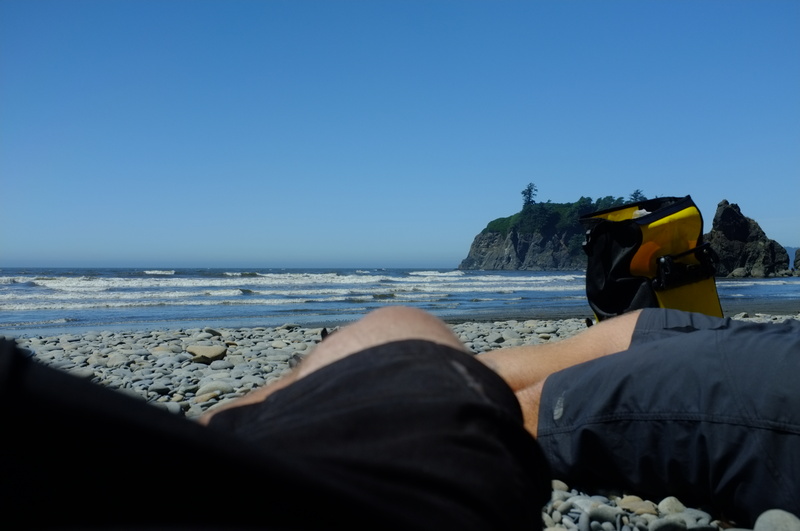 I thoroughly explored coastal Washington and found it to be as wild as it was beautiful. 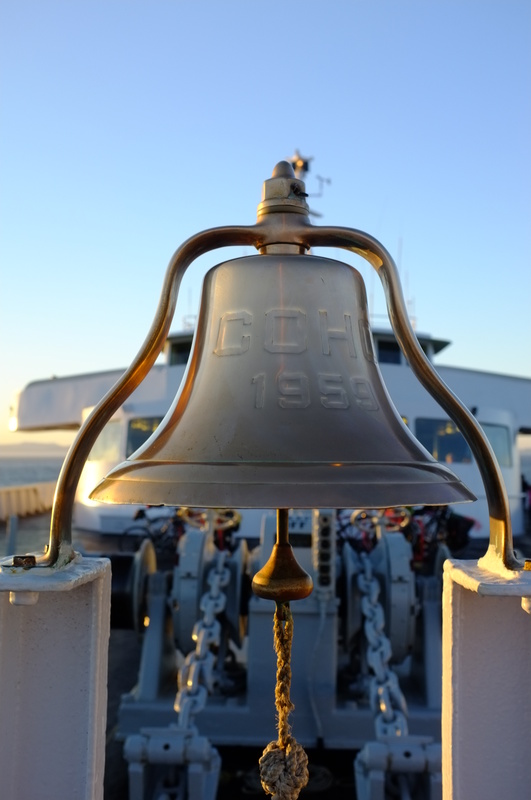 Leaving the San Juan Islands via ferry, I entered Sidney Canada, crossing my first international border via bicycle, receiving my first passport stamp, my first flag of the trip, and my first round of vaccinations – health care is SOO much cheaper in Canada. 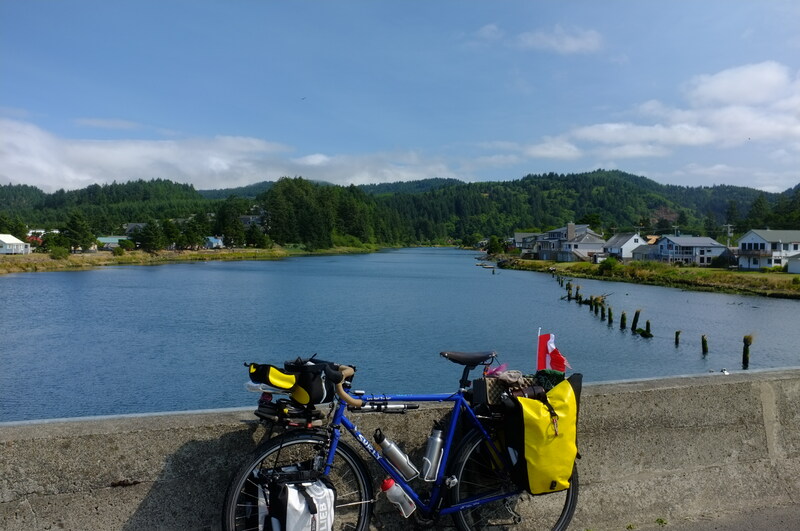 A short ride south and I was in Victoria, Canada where I caught a ferry into Port Angeles, WA. I also teamed up with two other riders. 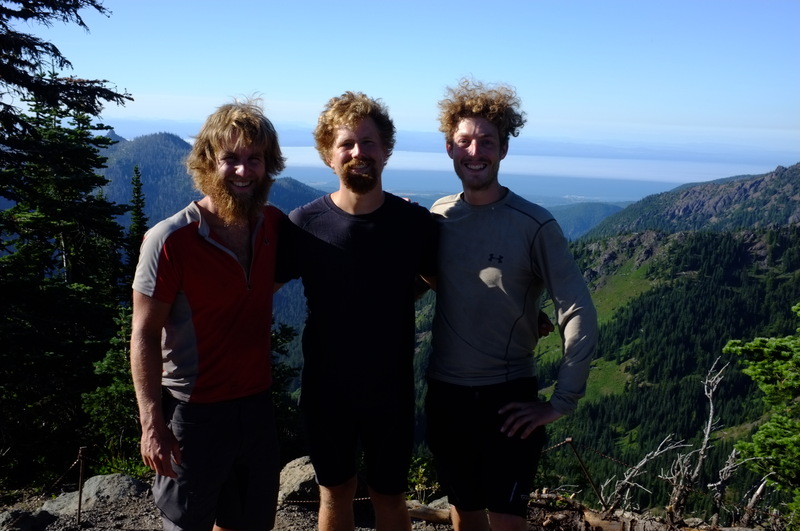 The three of us after the 17 mile ride up Hurricane Ridge. Ironically, we payed $5 to torture ourselves. It was well worth it for the hour-long ride down! Tyler and Nick are on a very similar trip. 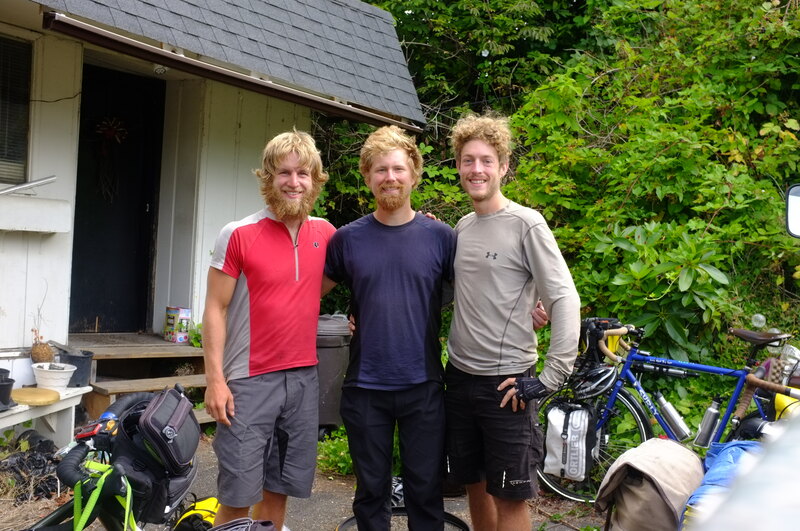 They began in Alaska and are riding to Central America. They are 25 and 24 years old and have very similar motivations as myself for such an undertaking. 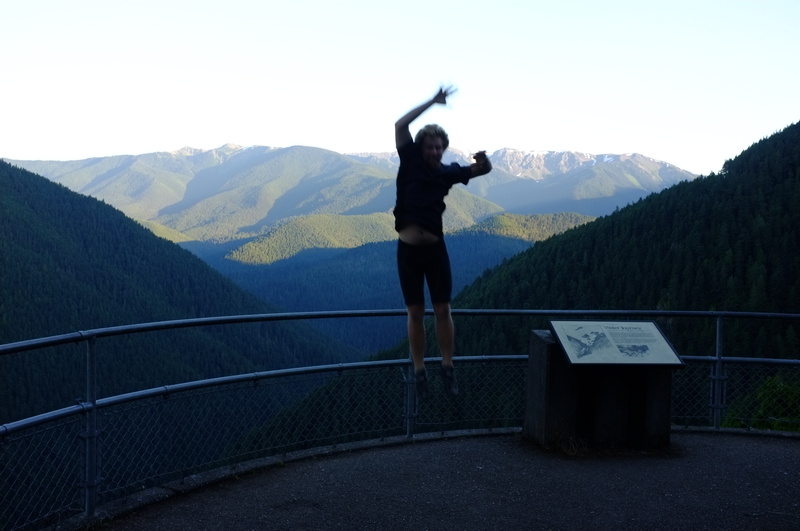 As a group we: cycled 17 miles to an elevation of 5,000+ feet at the top of Hurricane Ridge, swam in the frigid waters of a 600ft deep glacial lake, dodged vampires and werewolves through forks, passed a rain forest, soaked up the sun on a stone beach, and on our last night together shared a drink (and something else now legal in the state of Washington. 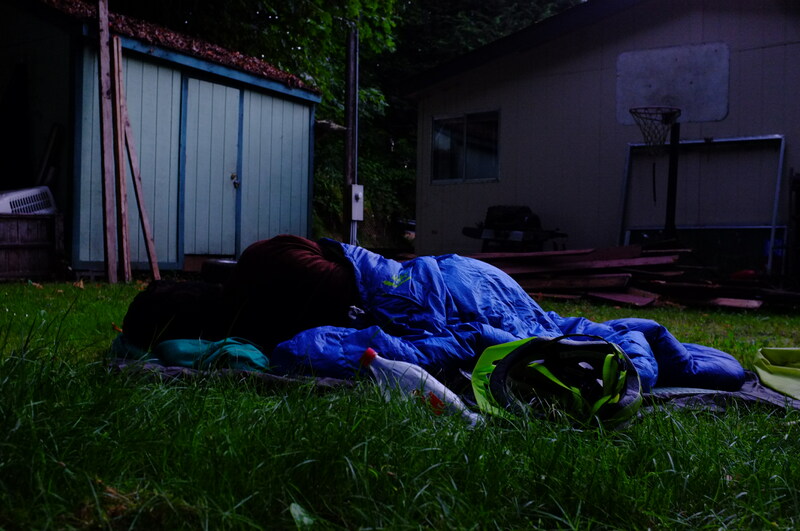 When in Rome…) in the tiny town of Raymond, WA where we were invited to crash on someones couch. In the morning we all went our separate ways. 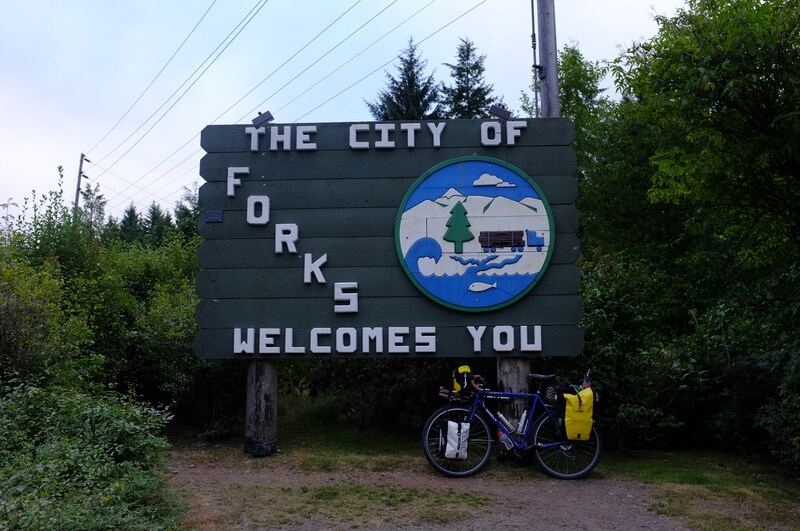 Tyler pedaled east to ride the Cascade Mountain route. Nick, having a week to kill, decided to spend more time in Raymond before heading to Portland, OR to meet-up with a friend. And myself sticking to rt. 101 continuing on my journey south. In Raymond I receive a wonderful piece of advice from Manny; a fellow traveler from Mexico who left home at 14 on an order from his mother, “Go across the street and get the backpack from your cousin. 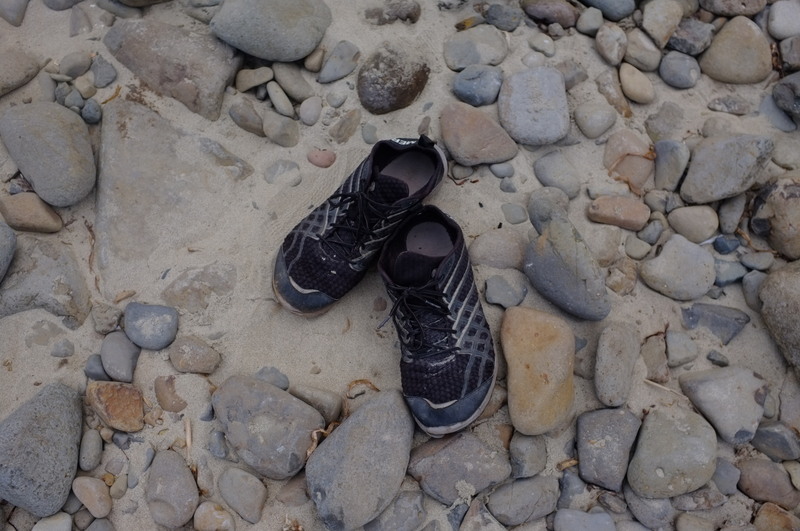 Don’t come back for one year.” (he didn’t return for four years). Manny’s advice was simple though poignant, “Don’t blink.” He could not have been more right. I left home almost one month ago and have pedaled 862 miles. Time is flying by. My new friend Chris who is on a roadtrip around the US visiting every park he can. 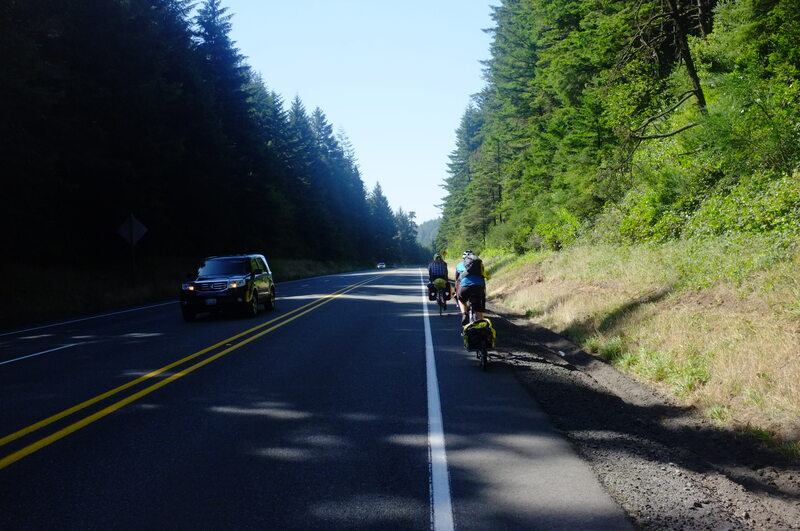 Also interesting to note, is the large number of touring cyclists here on the west coast. I expected to see more than on the east coast. The actual number I have met however, is staggering. Since turning south, I have yet to ride a full day alone and every campground is filled with our kind. It’s almost too much. I am used to feeling a certain amount of loneliness when traveling solo. 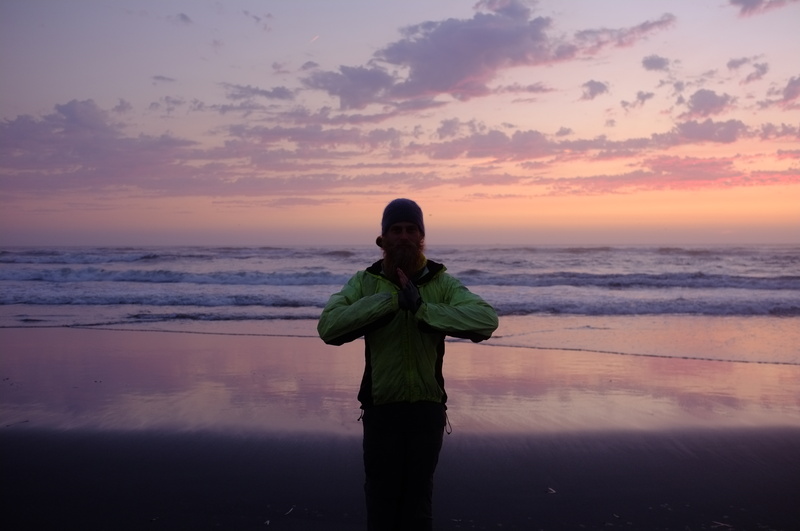 On this trip, I’m experiencing the opposite and find myself seeking solitude whenever possible. It’s really rather strange. If I sound like I am complaining, I am not. I’ve made countless new friends and cherish every interaction with fellow travelers. I just wanted to make note of this peculiarity. 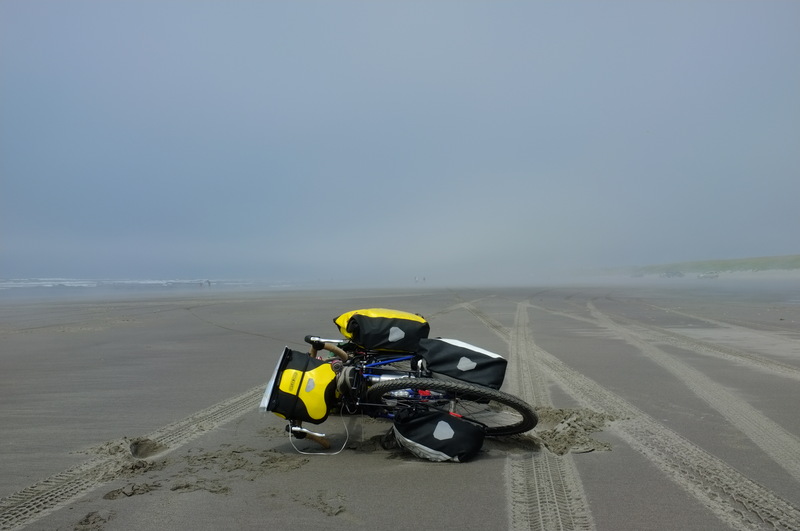 I rode over a mile down this beach only to encounter sand too loose to ride through. I decided to turn back. Anyway, I find myself constantly declaring a place to be the most beautiful and spectacular yet. Oregon is no different. 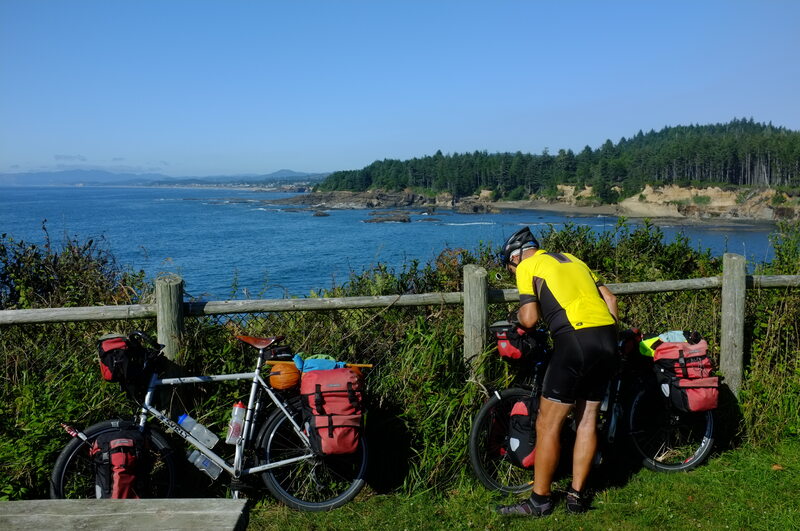 For 370 miles I follow a marked bike route along the coastline. 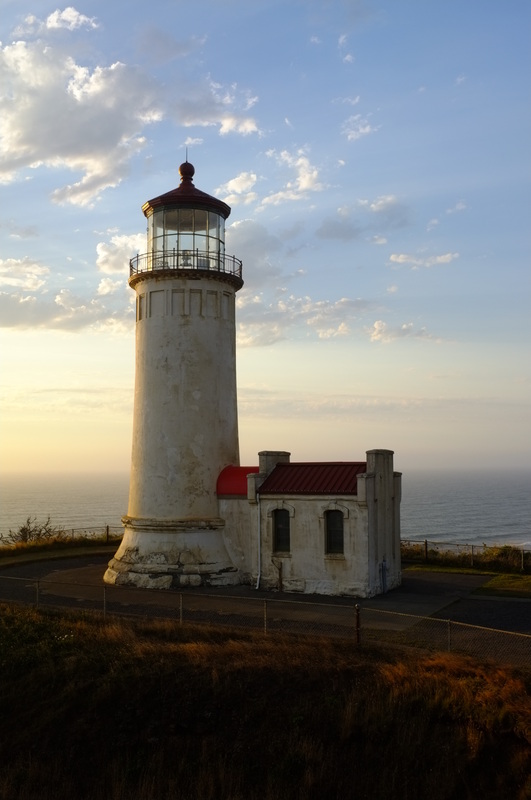 Many people have declared this to be the best section of the Pacific Coast. While I have only experienced 50 miles of it, they are right so far. 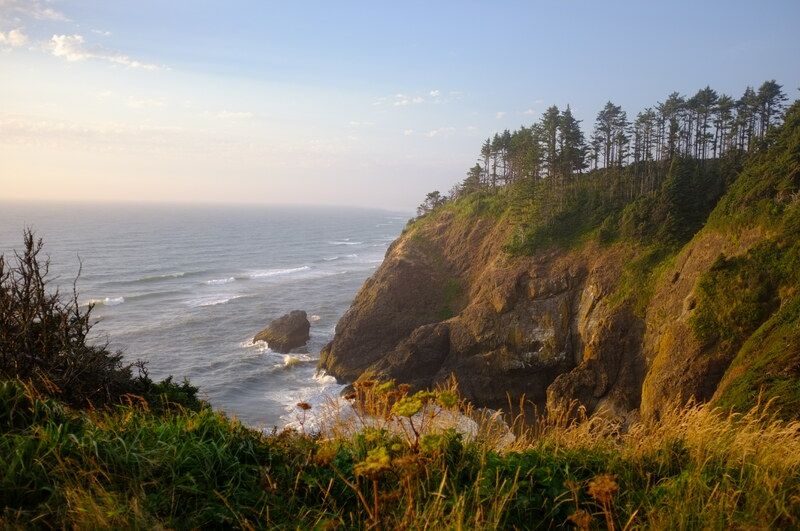 This section of coast offers expansive views from atop cliffs of welcoming sandy beaches which are even more comfortable for lounging than they look. 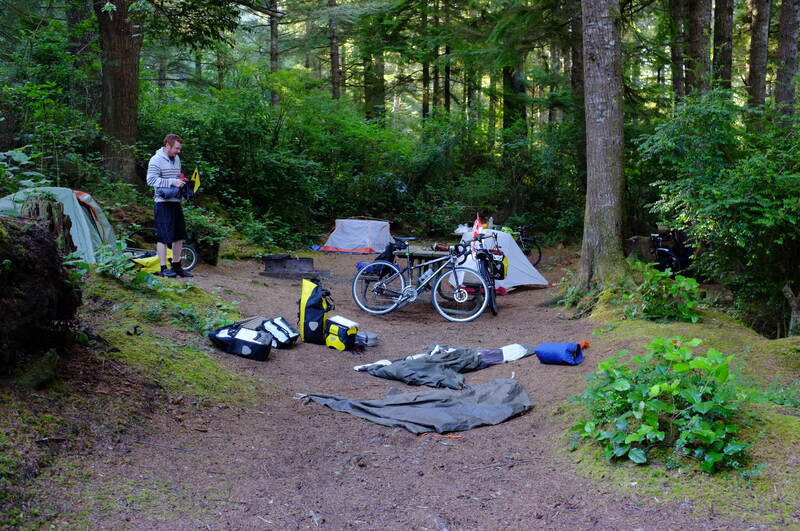 The campgrounds here really stand out with $6 hiker-biker campsites and, more importantly, free hot showers! I am feeling very spoiled lately. I apologize for the lack of updates lately. Rt. 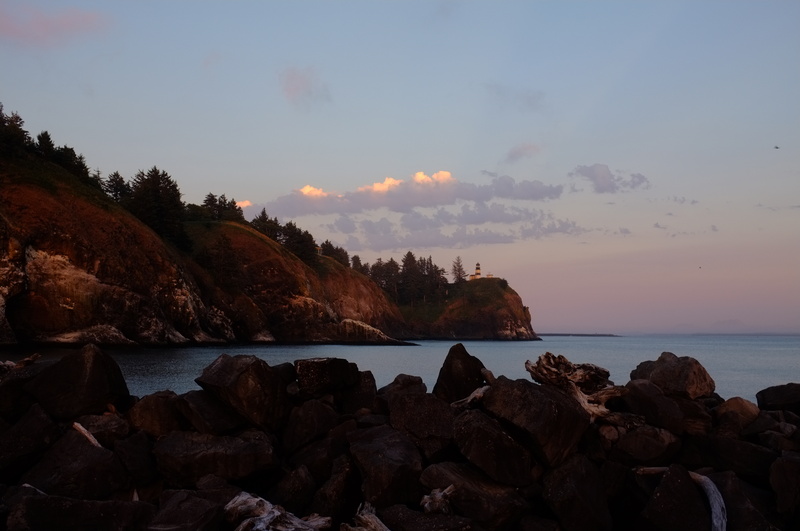 101 around the Olympic peninsula is very remote. In Aberdeen, WA I was able to post two backdated pages. 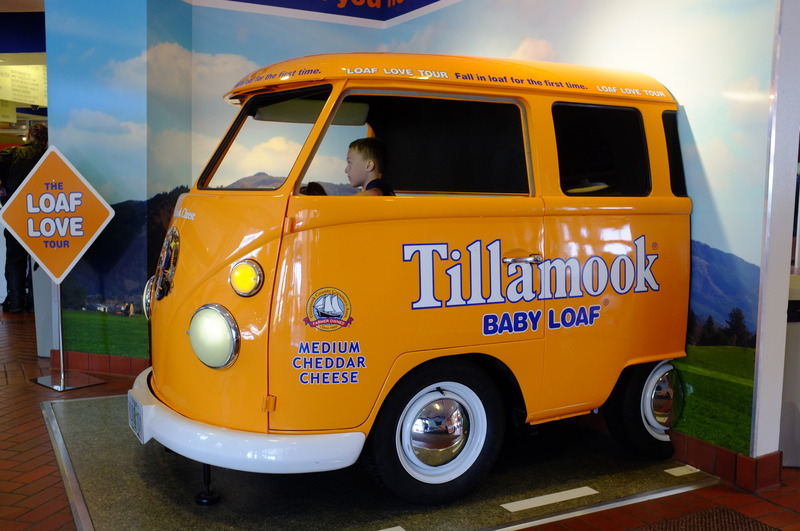 This post brings the blog to my current location: a Starbucks in Tillamook, OR overloaded on coffee and cheese. Updates will come more frequently now that I am back in civilization at least until I enter Mexico. Who knows what will happen then. Hope all is well. !Hasta Luego mi amigos! The start of my flag collection! 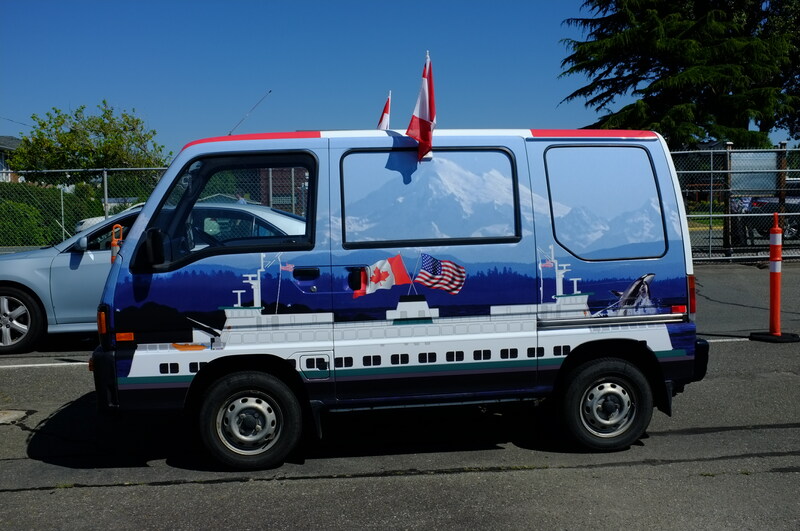 This deck of the ferry from Victoria, Canada to Port Angeles, WA where I met my new friends. 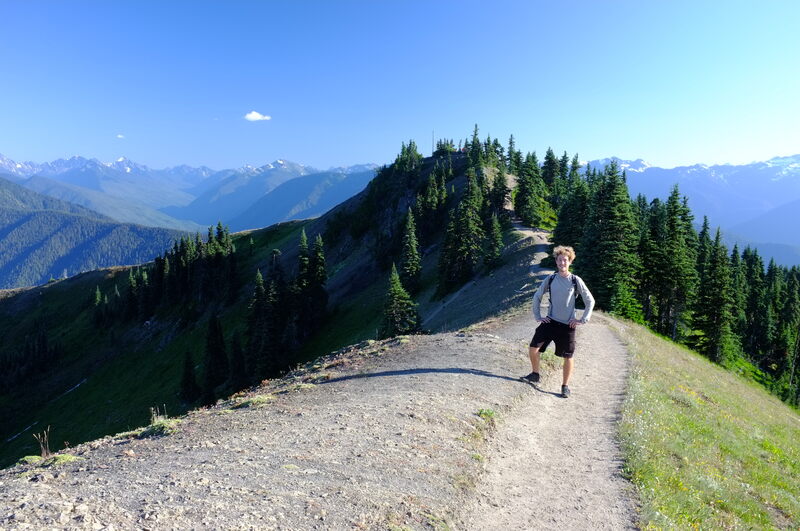 Me atop Hurrican Ridge in the Olympic Mountain Range. Goofyness on the way down the mountain. We were attempting to self-timer a shot of all of us jumping… this was much easier though not nearly as fun! Nick sleeping at an RV park in Port Angeles. They didn’t have tent sites so the woman stuck us in the back of her messy yard. And the price? $20. We got ripped off. 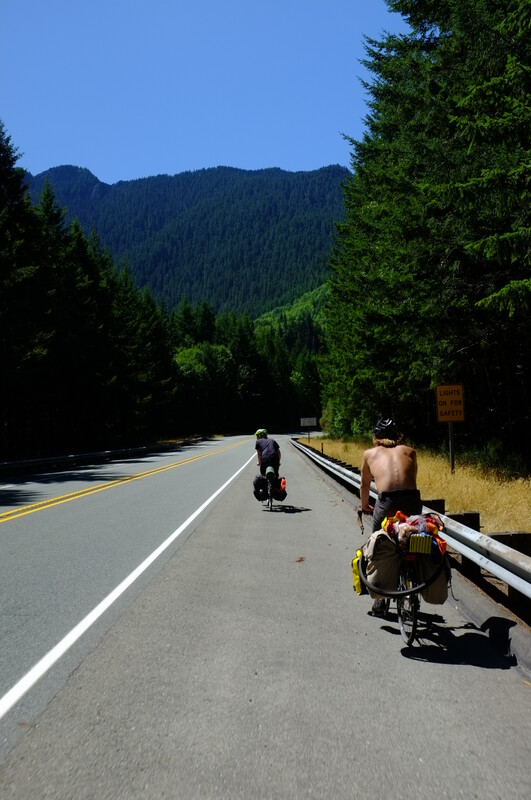 Riding round the Olympic Peninsula. Tyler swimming in the 600ft deep glacial lake. Can you say refreshing!!! Look out for vampires and werewolves! 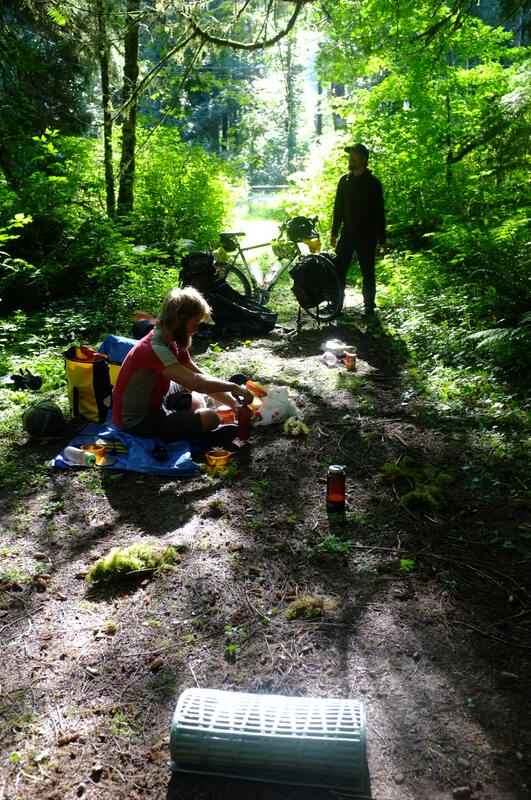 This lovely couple kindly shared their campsite with us. There were no other sites open. Stones worn smooth by crashing surf warm my back as the sun warms my front. Living the life! Camped on the side of the road 40 miles north of Aberdeen. Final farewell to my new friends after spending the night on the couches of a welcoming Raymond, WA native. Thanks Micheal! Preparing to cross the 4.1 mile long Astoria-Megler Bridge. We made it safely across. Yea! 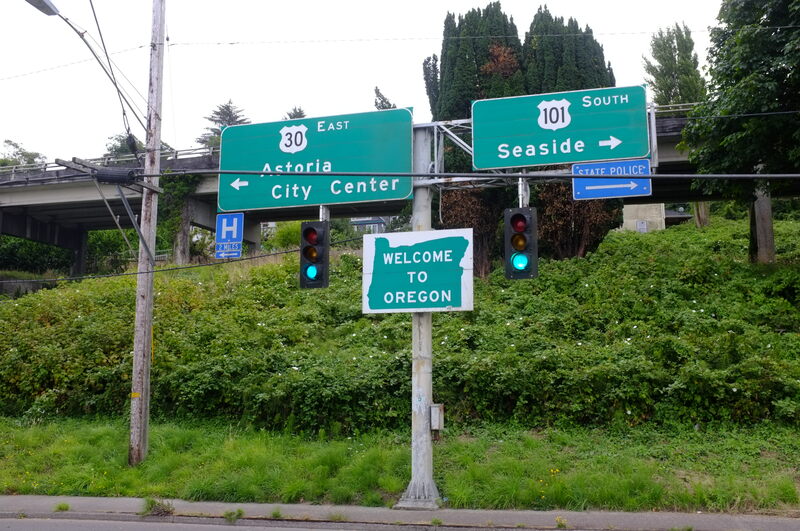 Back in Oregon, I have crossed my first state of the Journey. The best sunset of the trip.